Smart Allergy Friendly Education: Kraft Original BBQ Sauce - Pre-Packaged Sauce for your holiday weekend parties! 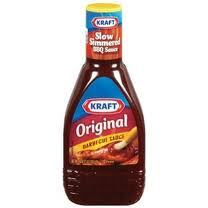 Kraft Original BBQ Sauce - Pre-Packaged Sauce for your holiday weekend parties! With the Memorial Day weekend quickly upon us, I know many people will be serving up barbecues with chicken, ribs and many other picnic favorites needing barbecue sauce. When we have time, I prefer to make my own sauce which doesn't have all the high fructose corn syrup and 'other stuff' that comes with pre-packaged products. Sometimes, it does help to have an item I know I can quickly get at the local grocery store. There are other fancier, healthier and more expensive brands, but there is only one which my kids will use. They like the fact that it is NOT TOO SPICY. What I like the best, is that it is dairy/egg/nut and fish-free. It also has the circle K, Pareve symbol on the front, indicating it meets the Kosher standards of being dairy/meat- free. If you've read my most previous blog, you'll know why I like this labeling!! Kraft Original Barbecue Sauce, distributed by Kraft Foods Global, Inc., Northfield, IL. Ingredients include: HIGH FRUCTOSE SYRUP, VINEGAR, TOMATO PASTE, WATER, APPLE CIDER VINEGAR, MOLASSES, SALT, MODIFIED CORNSTARCH, CONTAINS LESS THAN 2% OF NATURAL HICKORY SMOKE FLAVOR, MUSTARD FLOUR, DRIED GARLIC, SPICE, DRIED ONIONS, PAPRIKA, CARAMEL COLOR. I had a bit of challenge trying to get to their main page to find their contact information. This could be a bit more user friendly. But I finally found what I was looking for to share with you all. For more information, contact: http://www.kraftfoodscompany.com/home/index.aspx or 1-847-646-2000. I would love to hear about some great homemade recipes. I'll even post them if you approve! Have a great Memorial Day holiday weekend and enjoy the picnics, weather permitting!